✔ Put some stone in the bottom of the container for helping draining water and avoiding leting dirt out. ⚠ The biggest danger in growing succulents, especially in pots, is overwatering. Both indoors and outdoors, succulents are require little care and water. 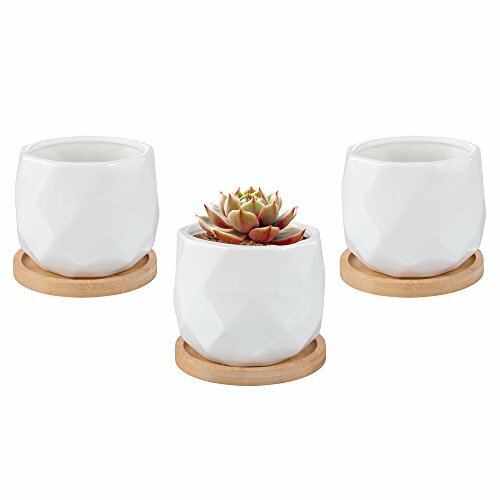 Treat your succulent or cactus to a elegant home with these Mkono modern ceramic pots. The biggest danger in growing succulents, especially in pots, is over watering, so a planter with hole should be your top priority. The best pots have holes in their bottoms for excess water to drain out, and planter saucer prevents floor or table from being wetting. Planter Dimension: 3" in opening diameter, 3" in height, 2 3/8" in bottom diameter. Saucer Diameter: 3 3/4". Please note that NO plants or ornaments are included in this item. If you have any questions about this product by Mkono, contact us by completing and submitting the form below. If you are looking for a specif part number, please include it with your message.